A doctor and a top-notch birder, Dr. Chetna Sharma‘s enthusiasm for birds has brought the joy of birding to many in and and around Haryana. I am a medical doctor with an M.D. in Pathology as well as a sonologist having my own diagnostic centre with a lab named after one of my favourite bird Ibis i.e. Ibis Path Lab. I live in Kaithal, Haryana. I got interested in birding when I made my first visit to Corbett National Park some fifteen years ago. Though love for birds and animals comes from my father who used to bring me all sorts of books on wild animals and birds from book exhibitions when I was a kid, I was quite disappointed when I was not able to sight a tiger in the Corbett National Park. But it was a blessing in disguise as I was introduced to the world of birding by none other than the male Asian Paradise Flycatcher with its long flowing white tail. Then I borrowed my first bird book, i.e. Collins Handbook of Birds, from my brother-in-law. I began observing the common birds around my place and learning their names and there was no looking back after that. I joined the Delhi Bird Network and made some great birding friends and was fortunate to do some bird walks with them. I have many favourite birds but I love Hornbills, especially the Indian Grey Hornbills as I have been observing them from my balcony since I started birding and I think they are also familiar with me now. It’s such a pleasure to watch all their rituals. I love Parrotbills as well. 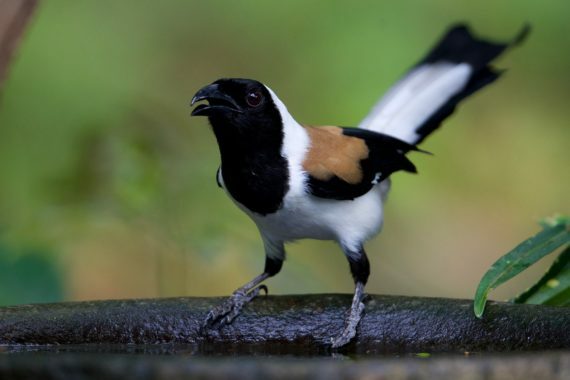 I think they are the cutest birds of all and I have been fortunate enough to visit North-East India and see them in quite a few numbers, with Spot-breasted Parrotbills from Walong in Arunachal Pradesh being my favourite. I enjoy birding everywhere especially the North-East but my favourite place, or a patch as eBird calls it, is a village called Thana near Kaithal where I have observed more than 200 species of birds. Its a small wetland with old Jaal trees on its banks. I am trying my best to get it declared as a community reserve, a first of its kind in Haryana. Note: As of 8 July 2017, Thana village was declared as a community reserve by the Government of Haryana. I do have couple of friends with whom I love to bird with , even my sister is also a keen birdwatcher and now some local college students are also my birding pals. But I think birding alone is also very relaxing and more fruitful. I can spend as much time looking at birds and taking pictures of them. I was fortunate enough to be invited to the local RKSD college by Professor Dr Gagan Mittal for a presentation on birdwatching and interact with zoology students and since then I have given few talks on birds at different wildlife functions organised by the govt of Haryana. Nothing special on my bucket list for birds, but I would love to see all the birds of India at least. I think I have seen around 900 birds of India. I joined eBird 2 years back and since then, I have been eBirding almost every week. I was very excited about the Last Birder Standing challenge but unfortunately my eBirding got disrupted in June so I suppose I am out of the challenge now. eBirding has made me more passionate about birding as I love to put every bird list on eBird. eBirding is such a good documentation platform. I have learnt a lot more about birds since I started eBirding because it has made me more observant of their behavioural patterns in their breeding and non breeding phases, their calls and their breeding plumages amongst other things. No special goals for birding in coming months but yes I do go out for birding everyday in and around Kaithal. I have pledged to take at least one week birding holiday every month which in itself quite a big challenge as it’s difficult to take time out from my busy schedule. My message to fellow eBirders would be to post at least one list a week and get more birders to contribute to eBird. In the end, I would like to say birding has not been a hobby but a life-changing activity for me as it has brought me closer to nature, changed my perspective towards wildlife, and made me more sensitive to our birds. I learnt photography because of birds and have derived so much pleasure by just looking at them, so now I feel its time to give back to them by conserving their habitats which are fast dwindling. Lovely article. Made me smile reading it. I think a lot of us were lured into birding by our messerising Paradise Flycatcher. It’s really remarkable that how she manages birding with her professional job. Keep it up. Thanks for sharing. It is nice to see Dr Chetna doing serious birding in spite of her heavy routine work. But also observe it that only people with heavy load of work becomes good and sincere bird watchers. Great job to know about birds man ki batt. ..